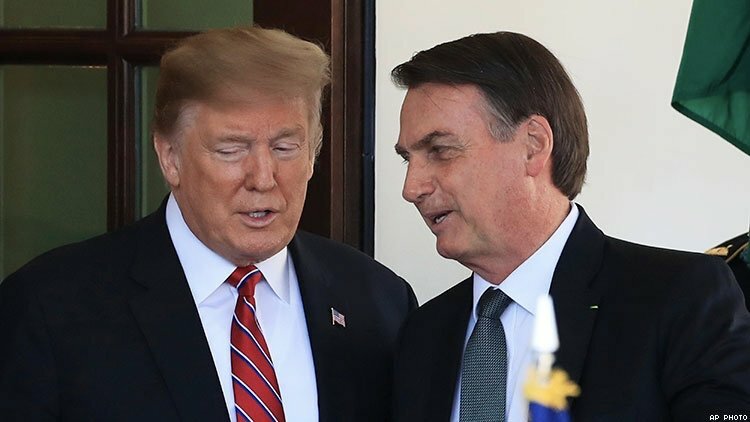 After the two leaders met, Jair Bolsonaro lauded the U.S. president for opposing "the gender ideology of the politically correct attitudes." Jair Bolsonaro, the anti-LGBTQ president of Brazil who’s been called the “Trump of the Tropics,” praised Donald Trump’s similarly anti-LGBTQ ideology after the two met today. “In conclusion, may I say that Brazil and the United States stand side by side in their efforts to share liberties and respect to traditional and family lifestyles, respect to God, our creator, against the gender ideology of the politically correct attitudes, and fake news,” Bolsonaro said at a White House press conference. He also said he and Bolsonaro were united in opposition to Venezuela’s president, Nicolas Maduro, and other regimes they consider socialist. “The twilight hour of socialism has arrived in our hemisphere, and hopefully, by the way, it’s also arrived, that twilight hour, in our great country,” Trump said. Trump said he intends to designate Brazil as a “major non-NATO ally” or perhaps even a NATO ally, referring to the North Atlantic Treaty Organization, a security alliance formed after World War II. “Something’s happening with those groups of folks that are running Facebook and Google and Twitter, and I do think we have to get to the bottom of it,” he said.